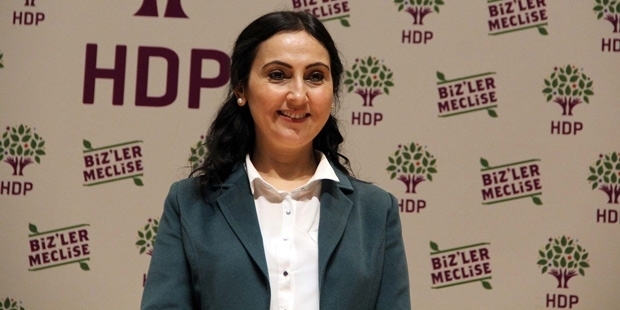 An indictment prepared by a Van prosecutor is seeking a jail sentence of up to 10 years for pro-Kurdish Peoples’ Democratic Party (HDP) Co-chair Figen Yüksekdağ for “disseminating terrorist propaganda” during a public rally in April 2016. Yüksekdağ were put behind bars along with eight other HDP deputies in November 2016. The indictment, prepared by the Van Public Prosecutor’s Office, accused Yüksekdağ of using the word “martyr” for Kurdistan Workers’ Party (PKK) members during the HDP Congress in Van on April 9, 2016. The indictment, which was accepted by the court, demanded up to 10 years in jail for Yüksekdağ on charges of terror organization propaganda and revealing a danger that is obvious and close in terms of public order. Yüksekdağ was sentenced to 10 months in 2016 for participating in 2012 in the funeral ceremony of Yasemin Çiftçi, a member of the Marxist-Leninist Communist Party (MLKP), a terrorist group affiliated with the outlawed Kurdistan Workers’ Party (PKK). In April 2017, the İstanbul 22nd High Criminal Court also handed down a prison sentence of one year to Yüksekdağ for disseminating the propaganda of a terrorist organization. Yüksekdağ was sentenced on June 6, 2017 to 18 months in prison by another court for disseminating the propaganda of a terrorist organization in an interview she gave to Deutsche Welle. The Adana 11th Penal Court of First Instance convicted Yüksekdağ in June 2017 with one year in prison for a speech she made during a press statement event in Adana on Oct. 12, 2015. The parliamentary status of Yüksekdağ was removed in February after the Supreme Court of Appeals upheld a jail sentence in September 2016 handed down to her in 2013. Yüksekdağ was arrested in a police operation on Nov. 4 of last year along with eight HDP deputies including the other HDP co-chair, Selahattin Demirtaş. Turkey has stepped up its crackdown on Kurdish politicians in recent months. Trustees have been appointed to dozens of municipalities in the country’s predominantly Kurdish Southeast, while hundreds of local Kurdish politicians as well as 11 HDP deputies including the party’s co-chairs are behind bars on terror charges.